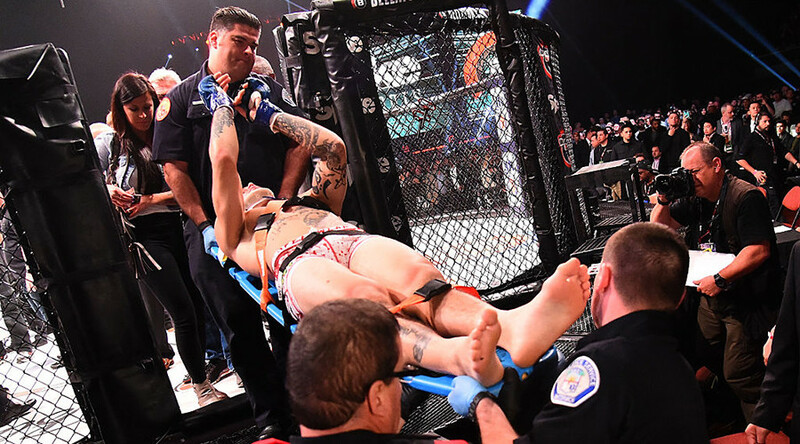 American MMA fighter Brennan Ward had to be taken out of the cage on a stretcher following a brutal flying knee knockout from Englishman Paul Daley at Bellator 170 in San Jose, California, last Saturday. While Bellator 170 was, in the words of the promotion’s boss, Scott Coker, their “springboard to another level,” as well as a night to remember for MMA veteran Tito Ortiz, who won his last career fight against ‘American Gangster’ Chael Sonnen, it also saw one of the most outstanding knockouts of 2017 so far. In the co-main event of the night, Connecticut native Brennan ‘Irish’ Ward, who had fought most of his career in Bellator, took on the English MMA veteran Paul Daley, who is known for fighting in the UFC and Strikeforce. The beginning of the first round didn’t seem to present any problems for Ward, who landed some good strikes on his opponent, while also getting two takedowns. However, after getting up from the second takedown, Daley shook Ward with a spinning elbow that visibly threw back ‘the Irish’. Not letting the moment slip away, Daley jumped up to land a huge flying knee on Ward’s head, knocking him out cold. After climbing to the top of the cage to celebrate his victory, Nottingham native Daley performed the famous Tito Ortiz gravedigger celebration as a tribute to the retiring veteran. The flying knee finish was a repeat of a knockout dealt out by another English Bellator fighter, Michael ‘Venom’ Page, in his fight against Evangelista ‘Cyborg’ Santos. Ward had to be carried out of the cage on a stretcher in a neck brace, though he managed to raise his arms with thumbs up to let everyone know he was conscious. While Ward seems to be recovering well and has showed a sense of humor, the flying knee knockout that floored Cybor Santos left the fighter with a fractured skull. After undergoing seven hours of surgery, Santos now says he’s “feeling really well,” but still had to retire from the sport after a 19-year MMA career. “I don’t think I will fight again,” he told MMA Fighting.